And keep yourself out of trouble. The school starters. Notice the missing child. Any sentimental foolishness that may rise up in me, with the knowledge my youngest, my baby is leaving me for 13 years of institutionalised education will be fully and thoroughly stamped out of me by the time she turns up for her first day. Wednesday: Years 1-6 start school. Now I understand there's a lot of admin and organisation to get a school like ours (600+ kids and 27 classes including a new OC class) back, sorted into classes and classrooms etc and I would never think the Kindy kids would start the first day. Neither do they start the second, third or fourth. Not until the big kids go for their fifth day, are the Kindy's allowed to go. FIVE DAYS! Thursday: Kindy kids attend a 'meet the teacher' session from 9:30-10:30. Parents go to the hall to learn how to 'pack healthy treats the kids will eat' or something and possibly be compelled to sign up for P&C, uniform shop, canteen and class mum. All important stuff, but surely the kids could do more than an hour? Like 6? Thursday/Friday/Monday: Each child is allocated a time for a little assessment. A bit of counting, name writing, colouring and alphabeting I expect. It takes 2.5 days for each teacher to test each child in their class. Couldn't possibly be done any other time (like periodically last year or gradually over the first term?). Guess not. Fair enough. I am no expert at school admin or organisation. I just know this is not happening at other schools. The kindys start later, but maybe a day later. Or two. Not FIVE. This means I still have my precious little school starter, who just wants to get out there, with me for 4 extra days. No preschool, no childcare. Just the kindness of friends so I can do a bit of work. How the full time working parents or those with less flexible employers than me manage this boggles my mind. Finally, next Tuesday, we are allowed to send them. For the first week only 9:30-2:30. So those of us with older kids get to hang around at school for an extra hour each day waiting for school to start, and then to finish. I cannot see the point of this. So by Tuesday morning, I won't be sentimental at all. And neither will she. We'll be sick of the sight of each other. Both ready to enter our 'other' worlds without any further style cramping. 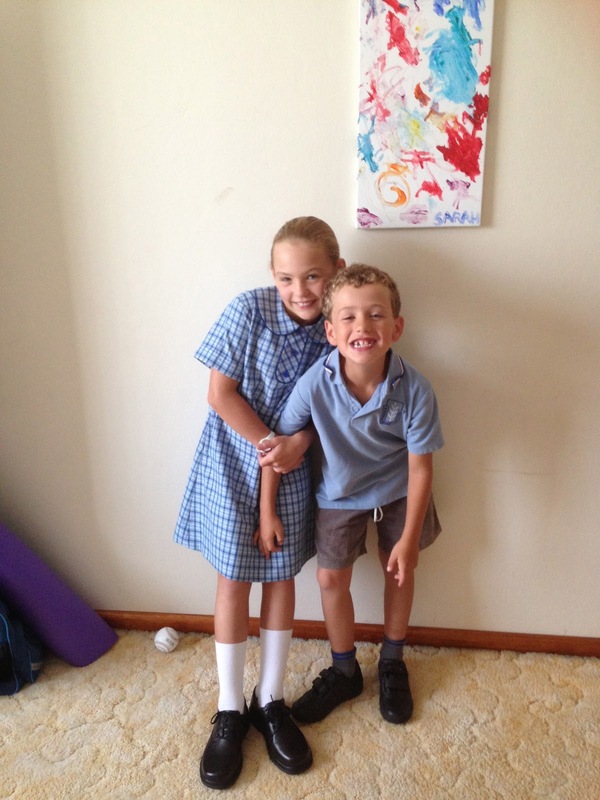 It totally takes the fun, the emotion, the grandeur, the build up out of starting school. It's now an over managed, careful, politically correct process. Ps. In todays school newsletter, the principal had the temerity to suggest the Kindy kids are, in fact, starting school tomorrow. Because meeting the teachers and doing a half hour assessment is so much like them being at school. Please. Delay the start for four days but please don't treat us like idiots. Until I don't have to arrange care for my kids during school hours, they are not 'at school'. Receive my blog via email. Burns Night: How have I missed this gem? Australia Day without tomato sauce. Six weeks, it goes faster than you think. Would you like sand with that? Yet Another Totally Epic Parental Fail. Can Your Marriage Survive Pinterest? The ongoing conundrum of kids and technology. Copyright Bec Christensen 2012. Watermark theme. Powered by Blogger.